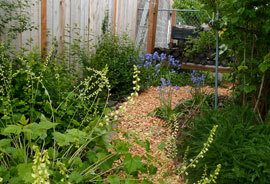 Naturescaping is the practice of using simple techniques that mimic nature so that your garden will thrive without using synthetic chemicals. This makes your yard a safe and healthy place for children, pets, and wildlife. A favorite practice for all levels of DIY landscapers and gardeners, Naturescaping saves time and money, inspires fresh ideas for your yard & garden, and makes your neighborhood that much more beautiful. One of Naturescaping’s core practices is using plants native to your area, in this case the Willamette Valley and Oregon in general. 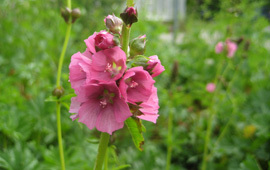 Native plants are adapted to our soil and climate, so they need little to no watering, fertilizing, or care once established. They are also more resistant to common garden pests and diseases, and provide habitat for a variety of native birds and butterflies. Naturescaping also saves you time and money! Click here for more tips and resources! Want to learn more about Naturescaping? Take a FREE Spring or Fall WorkshopHave us speak at your meeting, event or trainingVisit our office to see Naturescaping in person! Every spring EMSWCD also hosts a Yard Tour, where you can meet homeowners who have transformed their yards and learn how they did it. Our Urban Lands team recently went out to interview Philip, an avid naturescaping enthusiast! Learn what Philip likes best about his naturescaped yard in this video. Learn naturescaping essentials you can apply in your own yard.